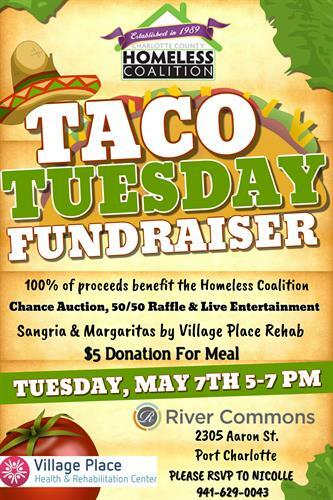 River Commons will be hosting the 2nd Annual “Taco Tuesday” fundraiser on Tuesday, May 7th from 5:00PM-7:00PM. The cost will be a $5 donation for the meal, There will also be a chance auction, a 50/50 raffle and live entertainment. River Commons is located at 2305 Aaron Street in Port Charlotte. 100% of the proceeds go to The Homeless Coalition to help benefit the programs and services. Sangria & Margaritas provided by Village Place Rehab. Please RSVP to Nicolle at 941-629-0043.